Bring the comfort of a traditional porch swing to public spaces creating a fun, relaxing environment. The 4' and 6' curved, contoured steel swing bench with arm rest features a decorative wave pattern that charmingly invites people to sit, relax and enjoy the day or scenery. Bench, chain and frame are constructed entirely with commercial grade steel that allows this contoured swing bench to be resilient, sturdy and enjoyable. 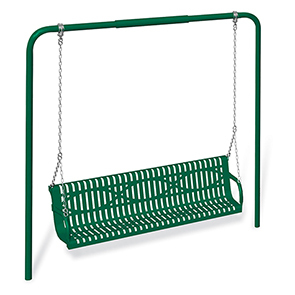 Comfortable, stylish design and easy maintenance are just a few of the features of these bench swings. The benches also feature smooth rounded edges increasing the safety and comfort. The polyethylene finished bench assembly is supported by a 2-3/8"O.D. powder-coated steel frame. Both finishes help maintain the bench swing's pristine aesthetic, colorfully protecting the steel against abrasion, rust and corrosion.